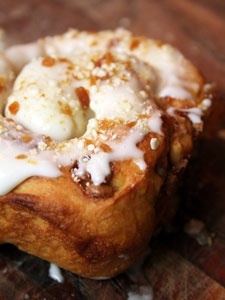 If you can make cinnamon rolls, you can make these sweet rolls. You can use a bread recipe but to make it even easier—easy enough for non-bread makers—use a mix. You can make it with your bread machine set on the dough cycle or with your stand-type mixer. If you use your stand-type mixer, use the dough hook and let it beat for about four minutes on medium speed. The gluten will be developed then. Roll the dough out on the counter, cover the sheet of dough with a layer of filling and roll it up pinwheel fashion. Cut slices, put them in a greased pan, and let them rise. When fully risen, bake them, let them cool, and frost them. Preheat the oven to 350 degrees. Grease a 9 x13-inch baking pan. Mix the bread dough according to package directions. Set the dough aside to rise. After the dough has risen, fold in the cinnamon chips kneading until the chips are dispersed. Do not knead more than necessary. Using a rolling pin, roll the dough into a rough rectangle on a floured counter with the dough about 1/4-inch thick. Spread the pastry filling on dough. Roll the dough into a log with the filling trapped inside. Pinch the seam with your fingers to keep the filling from falling out. Cut slices horizontally about 1 1/4-inches thick. Place the slices in the prepared pan. Bake for about 30 minutes or until done. The center of the rolls will register 190 degrees with an insta-read thermometer. Times will vary with different pans. Let the rolls cool for five minutes and then frost them. While the frosting is still soft, sprinkle with the Cinnamon Apple Bark Topping. 4 ounces of cream cheese, softened. Beat the butter and cream cheese together with the whip attachment of your stand-type mixer. Add the flavor and milk. Beat the mixture, adding powdered sugar until the consistency reaches a soft frosting just right for spreading.